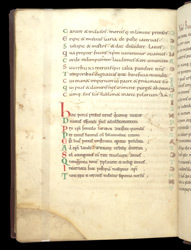 This manuscript contains a variety of different works concerning St. Swithun, Bishop of Winchester (d. 862), including a tract on miracles attributed to him; a hymn in which the first lines begin with the letters from A to Z, followed by four more beginning with A, M, E, and N; and a biography written in verse. A collection such as this is unlikely to have been compiled anywhere but Winchester. This page includes the end of the verse biography, and an added (late 11th- or early 12th-century) verse inscription for Swithun's gate and bridge--evidence of the manuscripts continued ownership in Winchester.